[SUPER ELEGANT AND HIGH QUALITY]: HOORAY!! IT'S A GIRL!! This precious time in your life deserves only the best, that's why we have created this custom and unique package! Unlike tissue paper fans, our fabulous Baby Shower Decorations for Girl includes fans that are made from the highest quality card stock paper with gold foil that's durable and reusable. [BUDGET FRIENDLY]: Save money, time and effort looking for overpriced Baby Shower Decorations at expensive retail stores. Our affordable set has everything you need to make your party sparkle. This set includes: (1X) glittery pink and gold "Baby Girl" Banner on extra long gold twine, (8X) Paper Fans with Gold Foil, (8X) Flower Glittery Gold Centers for Fans, (12X) Tissue Paper Tassels-rose gold, baby pink, peach, cream, polka dots, tan. TOTAL:29 PIECE SET! [QUICK AND EASY SET UP]: Fans come with pre-attached string for hanging and is pre-taped so you simply have to peel the film and stick the ends together. Banner is PRE-STRUNG for your convenience, simply unfold and hang. Tassels are easy to assemble, we have included a visual instruction for you convenience. Flower centers come with sticky dot glue, just peel and stick on the fans. 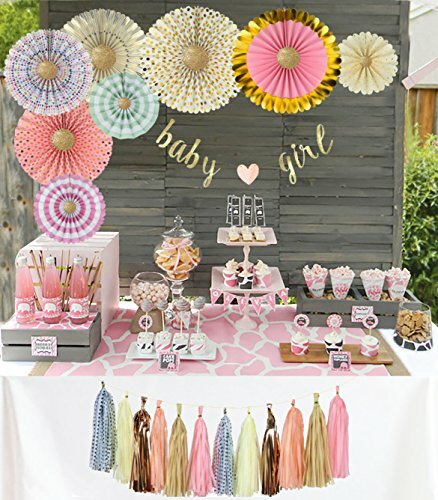 [VERSATILE USE]: This set is a great Baby Shower Decoration Idea that will surely WOW your guests! After, use for Christening, baby's first birthday, as party decorations, backdrop for photography or even decorate a colleagues office for a surprise party. Use indoor, outdoor, hang on ceilings, walls, tables, trees and more. [YOUR SATISFACTION IS GUARANTEED]: Love your Baby Shower Decor or your money back!